U.S.-China relations over the past two years have been a tale of two diplomacies. Secretary of State Clinton and Deputy Secretary Steinberg have been promoting a new American leadership designed to create “a new global architecture” that will “help integrate emerging powers into an international community with clear obligations and expectations.” American diplomacy, according to this vision, will help China and the other emerging nations to overcome the mistrust and suspicion that blocks international cooperation and burden sharing. The rise of a new global middle class and a shared sense of common threat and common interest will open new opportunities to make China and other emerging powers global and regional “anchors of stability” that cooperate, under American leadership, to uphold international law and universal rights. Yet, sharp ground-level exchanges over Iran, naval activities in the Yellow, East, and South China Seas and the valuation of the yuan are clear signs that the interests of the two powers are growing increasingly divergent. The inevitable failure to realize this vision of great power condominium will not be due to mistrust, an inability to see common interests, or, as many suggest, the interference of domestic politics on both sides, but rather to the changing, and clashing, long-term realities of power in Asia. A concert of great powers can work only if all parties agree on the political composition of the global order, and are satisfied with the distribution of military and economic power. This was the case in the European order from the end of the Napoleonic Wars in 1815 to the beginning of the Crimean War in 1853 – Metternich’s Concert of Europe. Contemporary Asia is in no way similar. Beijing and Washington do not share a common vision of the global political order. A critical mass of non-democratic governments, especially around its periphery, is geopolitically vital for China. These political imperatives underlie Beijing’s consistent refusal to cooperate with the United States’ proposed P5+1 alignment against the Iranian nuclear program. Maximum control over events in Central Asia has for centuries been essential to China’s security. Threats to China’s stability and even political existence traditionally have come from this region. The Han, Tang, Song and Qing dynasties were all fatally weakened upon the loss of this region to non-Chinese tribes and Arab powers. In the twentieth century, tensions and clashes with Soviet power along China’s northern and western borders were a major factor in driving Beijing toward strategic entente with America in the 1970’s. Ever since the demise of the USSR, Beijing has been striving to integrate Central Asia into its political and economic orbit, with the strategic objective of preventing the penetration of any political influences that might destabilize Xinjiang and Tibet, or leave China vulnerable to military coercion. Iran is the geopolitical anchor of this system. Sanctions that might lead to regime change in Tehran would threaten that order, and thereby, eventually, China’s own internal security. Similar political realities have undermined another Washington attempt at a concert of powers, the Six Party Talks concerning the North Korean nuclear program. The Korean Peninsula is the strategic key to Manchuria and to China’s coastal security. The 1894 Sino-Japanese War was a contest between the two powers for influence in Korea. China’s loss led to a weakened Qing position in Manchuria and along the coast that invited further aggression from Japan, Russia and the European powers. In the Korean War in the 1950s, China spent, by some estimates, over a million lives to keep North Korea in existence and in the Sino-Soviet sphere. Beijing is unlikely to take any action to undermine a regime that acts as a buffer against the United States, South Korea and Japan. Recent events show the opposite. China has boosted its economic aid and investment programs in North Korea, and Beijing has been particularly reluctant to use its considerable leverage over Pyongyang to force concessions on its nuclear weapons program. Indeed, Kim Jong Il’s recent visit to China, just as he is working to effect a smooth leadership transition, indicates that Beijing will remain deeply invested in the present North Korean regime. In military terms, China is clearly a revisionist power, profoundly dissatisfied with the present Asian security system, a reality that will seriously limit prospects for any architecture of collective security. America projects power in Asia through military alliances with Japan, South Korea, Taiwan, Philippines, Australia, New Zealand, as well as through a new strategic relationship with India, and a system of bases in South Korea, Japan, Guam, and Diego Garcia that keeps the sea lanes open, maintains stability on the Korean Peninsula, the Taiwan Strait, the South China Sea, the Indian Ocean, and, in a larger frame, between China and Japan. The People’s Republic has always viewed this reality as strategic encirclement. China’s challenge to this order is accelerating with its new-found economic power. Beijing has declared the South China Sea a “core national interest” and has moved to enforce its territorial claims to the Senkaku Islands (Diaoyutai Islands in Chinese), and the Spratly Islands, and to other economic resources in the Western Pacific, particularly oil. All of these actions are provocations against American allies and friends in the Pacific. Beijing is moreover beginning to back up these moves with the development and deployment of the naval power necessary to make them credible and lasting. China is developing a new anti-ship ballistic missile that can hit ships as far away as 1,000 miles, and is far more effective than a cruise missile. New weapons, plans to field a blue-water navy, complete with aircraft carriers, and new maritime relationships with Pakistan, Sri Lanka and Bangladesh, are vivid signs that Beijing intends to assert itself not just as a regional hegemon, but as a naval power capable of operating all the way from the North Pacific to the Arabian Sea. Despite talk of joint U.S.-Chinese management of the global economy, Beijing has not embraced liberal capitalism. Markets are tools of the state being used to boost the efficiency of an otherwise inefficient socialist system, and not yet the foundation of a liberal, free market, economy. Full Chinese compatibility with world trade and financial norms would require interest rate liberalization, the free flow of capital, deregulation and privatization, protection of property rights, market exchange rates, and international trade and financial liberalization. Beijing has yet to fully harmonize with any of these norms. China’s interest rates are determined by the state; the stock and capital markets are not fully open; the state still commands the largest sectors of heavy industry, transportation, communications and banking—what Lenin called the “commanding heights;” property rights do not inhere in the individual; land rights are not fully transferable; the yuan exchange rate is pegged to the dollar; and, although a WTO member, Beijing has proposed and negotiated with regional and other powers a number of trade agreements that do not adhere to WTO principles. China itself is beginning to tout a new economic development model that combines authoritarian politics with state-directed capitalism, a more managed, more mercantile system, which – if it were to replace the present free trade system—would be less open, less global, and less free. While this clash of power realities does preclude a new and stable concert of powers in Asia, it does not call for a policy of containment against China. If the present Asian order does not resemble the Concert of Europe, neither is it similar to the Cold War with the Soviet Union. There is no rigidly exclusive bipolar alliance structure in Asia. All of the governments in the region maintain complex and overlapping relationships with each other. But none of the major powers wants to see Beijing reshape the political, economic and military order of the region. The impulse on the part of Russia, India, Japan, Australia and the ASEAN countries to balance the disruptions to the status quo that a rising China will bring about will be quite strong. As both a Pacific and a Western power the United States is in a pivotal position to orchestrate a political and military balance that includes Beijing as an interested power but does not allow it to impose unilateral solutions on territorial issues such as the Senkaku Islands dispute, or to set the political course of the region on a path toward authoritarianism. Politically this means that Washington must actively promote democratic politics and human rights. Only the United States is capable of keeping the liberal option open to the peoples of the region. Without a strong countervailing liberal political presence, Asia will drift inexorably toward accommodation with Beijing’s authoritarian preferences. This in turn will require a healthy alliance system and the careful adjustment of the American military posture as the strength of other powers grows. As China develops and deploys new weapons systems, the United States must respond with enhancements of its own. Washington must also respond to any attempts – such as in March 2009, when the USS Impeccable was confronted by Chinese vessels in the South China Sea – to diminish the American Naval presence in the Pacific and Indian Oceans. Moreover, the practice of diplomatic and military balance of power must be combined with a policy of vigorous economic and business engagement that works to shape an economic environment to which China must be encouraged to adjust. The Chinese economy is now more integrated into global capitalism than the Soviet Union ever was. And it is this international component that remains crucial to the continued development of the country and to the survival of the present regime. China’s dependence on global commerce – the country’s GDP is now about 70% dependent on international trade and investment – brings with it openness to the leverage of the United States, Japan, South Korea, Taiwan, the EU, and the World Trade Organization. Such economic interpenetration makes it possible for the Western-aligned powers to exert great influence over the course of China’s economic reform and development, influence that should be used to encourage greater integration into world free trade and finance. 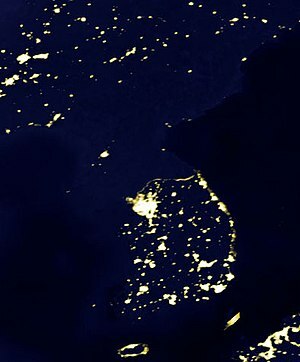 The U.S. should start by ratifying and implementing the U.S.-South Korea Free Trade Agreement, which should serve as a strong model for other regional agreements that would both comply with WTO principles and serve as a powerful alternative to the recent tendency in Beijing’s trade diplomacy toward managed rather than free trade arrangements. Momentum from the success of the agreement with South Korea should be applied to a reinvigoration of movement within the Asia-Pacific Economic Cooperation and the relatively new Trans-Pacific Partnership toward region-wide free trade and investment to include the entire Pacific Basin. Asia is changing very fast. It could either go in the direction of a stronger and continually advancing liberalization that could include China, or it could go in the direction of political regression, economic fragmentation, and military instability. A successful foreign policy must deal with these realities in order to promote the first outcome while avoiding the second. This is a long-term historical task that must be accomplished before a new global architecture of cooperation could become even remotely conceivable. Diplomatic Courier :: Diplomatic Community on World Affairs and Foreign Policy News. This entry was posted in Commentary, News, Reports and tagged Beijing, Center for Strategic and International Studies, Hu Jintao, Korean Peninsula, North Korea, South China Sea, United States. Bookmark the permalink.